A two and half hour drive from Aurangabad takes you to the world heritage site of Ajanta. Although it is nearer to the cities of Jalgaon and Buldhana, Ajanta caves are better approached from Aurangabad. The caves are built in a horseshoe shaped curve of the steep rocky gorge that rises above the river Waghore. These rock hewn caves, still glowing in their own natural colours, are the finest achievements of the Buddhist monks who arrived here in 2nd century B.C. and reflect the zenith of ancient Indian art and architecture. Though most were carved in the first 400 years span, but the work continued till 7th century A.D. The caves were suddenly abandoned, most probably to the nearby Ellora caves. They remained unknown and forgotten for centuries, until, in 1819, soldiers from a British hunting party found them, accidentally. The exquisite paintings on the walls of the caves and some sculptures depict the development in Buddhism, over the span of eight centuries. The central theme of the frescoes remain the life and times of Buddha. Then there are descriptive Jataka tales, when Buddha assumed forms of animals on the earth in his previous births. There are lions, elephants, monkeys, peacocks and geese with human forms of 'Yakshas', 'Kinneras' (half human and half bird) 'Gandharvas' (divine musicians), 'Apsaras' (heavenly dancers), which were of concern to the people of that time. All of them decorated with intricacy. Their half-closed eyes giving an air of meditation. The most important and better preserved caves are cave numbers 1, 2, 16, 17 and 19. The doorway has the most seen Ajanta frescoes of Padmapani and Vajrapani; celestial figures holding Lotus and Thunder bolt respectively in their hands. A court scene, from the Mahajanaka Jataka is depicted here. The Ummaga Jataka and the Champeya Jataka are shown in this cave. Interesting in these frescoes is the head gear of Bodhisattva Avalokiteshwara and the ornaments, clothes hairstyles and the purses carried by the womenfolk. They are drawn and coloured with minute intricacy showing the caliber of the artisans. In cave number 2 Buddhist icons were sculpted according to a set of codified rules that used symbolic hand gestures and motifs such as the wheel, the deer, the throne and sacred Bodhi tree. Each represents a stage of Buddha's life. The ceiling and wall paintings illustrate events associated with Buddha's birth including Maya, Buddha's mother. There are many paintings in this cave where the human figures are dressed differently than those of the others. Others are the tales from the Vidhurpandita Jataka. In between cave number 2 and 16 are many caves depicting the miracle of Sravasti. A special painting known as the “dying princess” adorns one wall of the cave. This shows Sundari, the wife of Buddha’s half-brother, dying when she is told that her husband was going to become a monk. There are many female attendants besides her, one being a nurse. Astonishingly enough, the nurse is shown wearing the same uniform as of today. Stories from the Vishvantara Jataka and the Hamsa Jataka can be found here. One fresco shows Buddha preaching, with his right hand raised and palm facing the viewer, in posture of blessing. Buddha is shown seated in Padmasana- the lotus pose of meditation and is often shown with his hair tied in a topknot surrounded by a halo of light, representing nirvana or enlightenment. Another touching fresco is depicted in this cave when Buddha came back to Kapilavastu after enlightenment. He is shown with his wife Yashodhara and son Rahul. Here the figure of Buddha is tall and his wife and son look like dwarfs in front of him, depicting his knowledge and prominence. 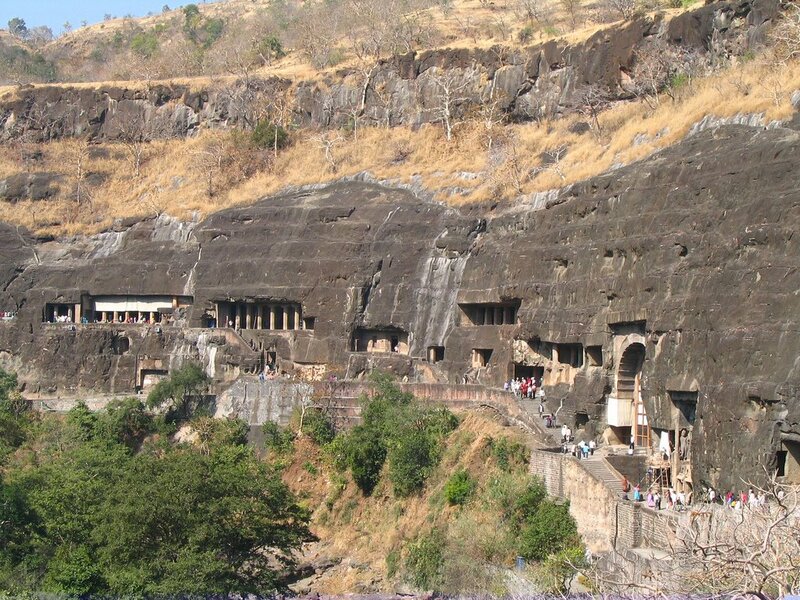 Just like the caves in Ellora, all the caves in Ajanta are Monolithic and carved from top to bottom. This cave carries huge Stupa structure with Buddha seated in it and celestial figures flying over it. Last of the caves which is intricately decorated and carved. The main sculpture here is that of the sleeping Buddha. It is the legend of his Mahanirvana; i.e. his death. While normal humans are seen mourning below, the celestial figures in the heaven are seen rejoicing. Ajanta is being restored with the same natural colours that were used, where they have been faded.